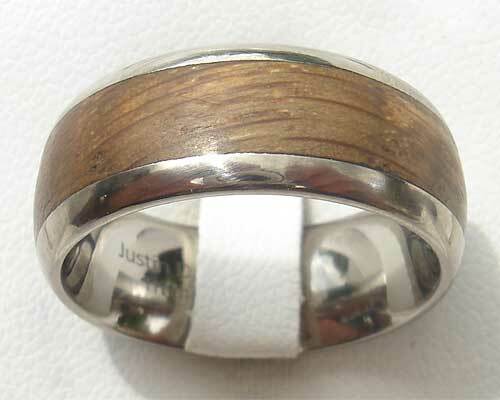 Wide Wooden Inlay Silver Wedding Ring : LOVE2HAVE in the UK! A wooden inlay silver wedding ring. If you are looking for a really wide wooden ring with plenty of wood for a wedding ring, then this is the ring you need. This domed profile wooden inlaid ring has a beautiful wide inlay that takes up a good proportion of the width of the ring. This model is the widest version of the rustic range we sell which would be suitable for a man. As the wood comes inlaid into the silver, the silver protects the wood from wearing away, unlike a wooden ring made entirely from wood only. It measures 10mm wide, and the silver is sterling silver. The inlay measures 6mm wide and made from oak. As we suggest in all our wider rings, do try our ring sizing service. The oak is inlaid in the centre of the ring and contrasts nicely with the silver. We have chosen oak as it is known to be a very durable type of wood and as the oak ages and darkens, it will create more contrast with the silver. The silver is matte in finish, and the inner is polished and therefore very comfortable. The fitting of it is a comfort one, meaning it is slightly curved and glides nicely onto the finger. When purchased together with the narrower version they make a very unusual wedding ring set, and the silver is beautifully finished to match the wider version. 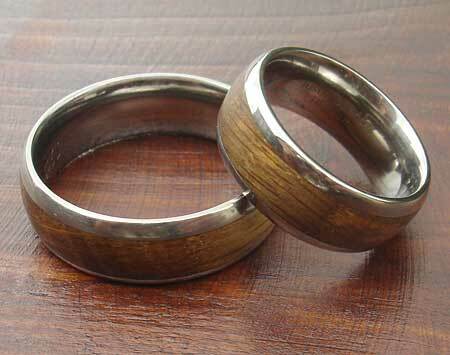 A lovely wide rustic ring with a wooden inlay and your first choice for a wooden wedding ring.